Every time we meet with my good friend MacTakis, it is always a great wargaming day, as we both desire to play a big battle. So, we checked what we had brought in our boxes... Takis has a sizeable number of Prussians and a smaller contingent of British. My idea was to play a scenario based on the terrain situation and maneuvers of the two armies (Hessians, Brunswickers and Prussians vs French). while the Prussians would fix the French at the front. The French would be mostly entrenched, keeping a weak refused left flank. 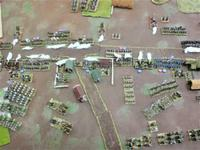 They would receive reinforcements from the rear and their cavalry which was stationed at their right wing, out of table. Repulse the Prussian frontal assault, not lose three important locations, The Angle (left corner of his array), The Town and The village. Skirmish as best as he can when the British will threaten his left, to delay them until reinforcements come. Deal with a big congestion at his rear, as he will have to direct troops where mostly needed. Apply even pressure to the French front or concentrate in some special point? Where to position his cavalry? 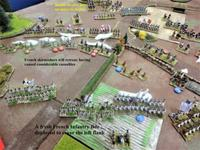 Exploit any gap in the French position to break through. strengthen it with reinforcements from the rear, while the British contingent would try to outflank them. The French had to bring lucky dice to see when their cavalry brigades would be able to enter. I put in a great number of them explanatory notes, so I hope one may follow the course of the battle just browsing on them. with dismounted dragoons and other light troops behind, actually not expecting a serious threat from there. to enter the table from the side opposite the tree lines. Takis decided to apply even pressure to the whole French front. all the Prussian infantry advanced forward. which is guarded by two French battalions. Du Roi Infanterie firing at the Prussians approaching. The Prussians attack the whole French front. Heavy firefights. The British Contingent appears between the woods at the French left. The French send their skirmishers to intercept them. Brigade Aquitaine and the French Heavy Artillery head to the left. The French Grenadier Brigade dithers between the Town and the Village. The French player, with a lucky 6 brings in his first Cavalry Brigade. A fierce attack by Prussian Grenadiers, aided with Jager fire and the French forces defending the Angle start to crumble! Prussian Grenadiers attack the Town. Two of the French battalions are decimated, the Town is contested in half. But the Prussians also have got many hits. One French Grenadier battalion intervenes, the Prussians are repulsed and the Town is again in French hands. The Prussians managed to put their foot at the Angle, two French battalions are done for. they have accumulated 4 hits and they retreat together with one more Prussian battalion. 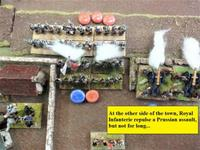 The Aquitaine brigade start to deploy to cover the gap. Prussian cavalry, following the infantry, did not find a good opening to exploit. This was the highest point of the Prussian invasion. 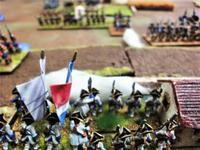 The British try to push the French skirmishers back. A heavy firefight ensues, where, by luck French skirmishers resist doggedly and they have quite a success. Before they retreat having accumulated 4 hits, one British battalion is done for. The Prussians took the village two times and two times the French managed to retake it. The Belzunce brigade guarding the area belongs to the past. It was by the combined attack of three French Grenadier battalions that the Village finally remained in French hands. 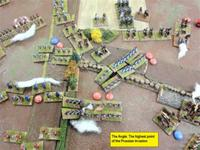 Pussian Jagers and Hussars attempted to infiltrate between the Village and the French right edge of the table. Meanwhile, the French managed to bring their second Cavalry Brigade (Cuirassiers du Roi) in the table. With their intervention, the French right was secured, the Jagers evaded, one Prussian Hussars and one French Dragoon regiment done for. It was the 7nth or 8th round we decided to call it a day. Most Prussian formations were out of steam. Takis even sent a Prussian Cavalry Brigade riding forward with gallantry and determination to pierce the weakened line between the Town and the Village, but they received a telling canister fire by two batteries and fell back to reform. 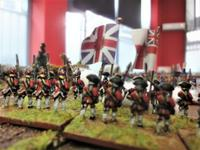 The British Contingent suffered serious attrition before making the skirmishers to retreat. 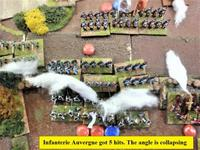 They lost valuable time and now the Angle was manned by the fresh Aquitaine Brigade. The French lost two brigades and the Prussians one. The Allies reached very closely to victory but the projection of the game would be a French win. All objectives remained in French hands. The three last pictures show the big final picture. It was a thrilling game, we much enjoyed! I put many explanatory (and some humorous ) notes, hope you'll enjoy! great report Dindin. Looks like Krefeld to me anyway. I'm really glad you think it looks the part! It is a pity you weren't with us last time, next Saturday I'm sure you'll lead the Prussian attack! I'm so lucky to have a second monitor. It works perfectly. Great report. I really enjoyed it. Haha! Yes, with a second monitor it is much more easier to follow the story! Thank you for taking the time to read the AAR, I thought I made it complicated, somehow.